Choosing Skincare products is sometimes tricky when our skin changes with every season! I have been lucky enough to not have issues with my skin when it comes to acne, but I have had more of the issue with dry skin and just recently a few dry patches! I have always been an advocate of washing your face every night! Even if we don't have makeup on, it is still good to clean our face from all the free radicals and pollution that our skin encounters everyday. I highly recommend using face wash and after every cleaning, moisturizing!!! I love baby oil for wiping my makeup off around my eye area! It is super soft snd makes it fast and easy so that you don't have to tug at getting it off! Our eye area usually suffers because we don't always remember that it's different from our whole face. The skin underneath our eyes is a lot thinner and should be separate when it comes to caring for them. Moisturizers are made differently and we should be mindful in using different ones for different areas. I have been using the brand Orgins for over a year now in my skincare routine. The face wash called Checks and Balances frothy face wash, not only smells good but takes my makeup off quite well! 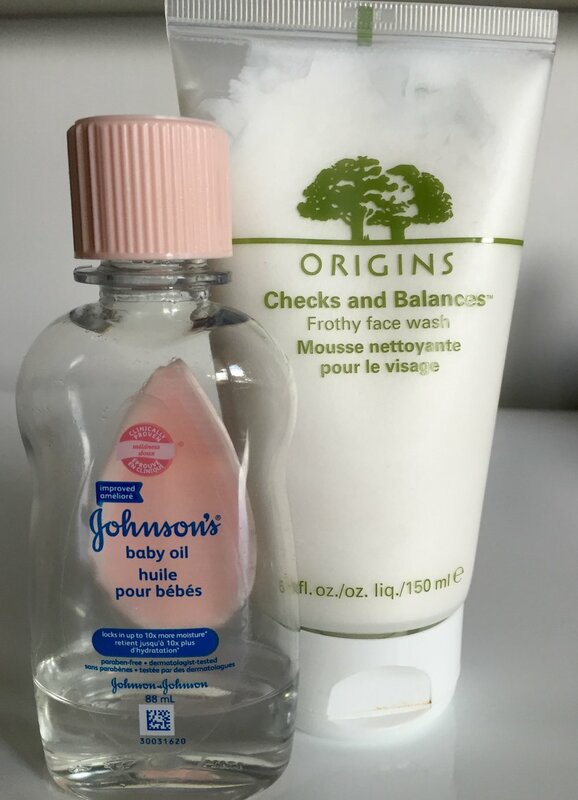 After I wipe my eye area with baby oil, I then clean the rest of my face using Orgins face wash with luke warm water to open my pores so that it fully cleans my skin. After I gently pat and rub my face to make sure the makeup is off with a dry cloth, I then rinse with cool water to close my pores right before I moisturize!! And I always moisturize at night when our skin is replenishing everything we have come in contact with throughout the day. So I wanted to make sure to get an actual night cream, to get the most out of when I would be using it. The Orgins High potency Night-A-Mins is perfect for this! My eyes have been so dry lately so I also made a conscious effort to find something specifically for this. 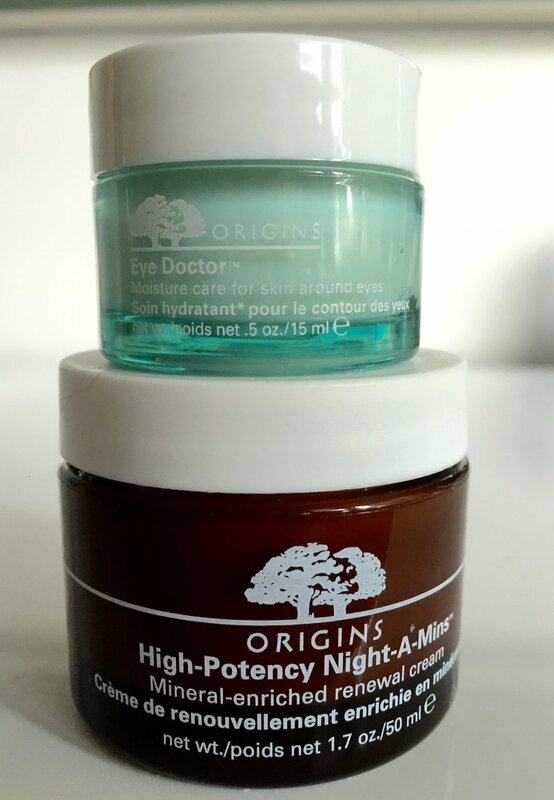 This Orgins Eye doctor cream has been working hard at keeping my eyelids much more hydrated so that it is a lot smoother for my eyeshadow to go on! I just recently noticed a dry patch on my left eye lid and after using this for only a week, it had reduced significantly!! It really works! I always make sure to apply my eye cream first, and then my night cream. The moisturizer I use before I put on my primer in the morning is also different. I have been loving Macs strobe cream because it gives my skin a healthy, subtle glow while keeping it hydrated all day long! And I also really love and have been meaning to replenish my Orgins GinZing Energy boosting moisturizer! Both the strobe cream and GinZing give your skin a healthy glow that I personally love! Besides my Mac strobe cream working hard for me during the daytime, Orgins has been working amazing for cleansing and replenishing my skin! And a bonus is the great price point! Although when it comes to our skin, I highly recommend not shying away from getting the proper skincare products, if your skin needs a little more attention, regardless of the price! After all, our skin is our biggest organ and it should be an area that we are making an effort to keep healthy! I also like to keep a bit of a tan throughout the winter months so I feel more refreshed! I use Loving tan mousse every once and a while to keep the glow I get from my moisturizers without harming my skin! Comment below your thoughts if you have tried any Orgins, Mac or Loving tan products, or other great skincare products for the winter months! I would love to hear what you are using and loving! Thanks for stopping by..